the most interesting watch 'blog you've never read. Probably. Sometimes you just need to put all the snobbery aside and admit to yourself that even a cheap watch can bring enjoyment. 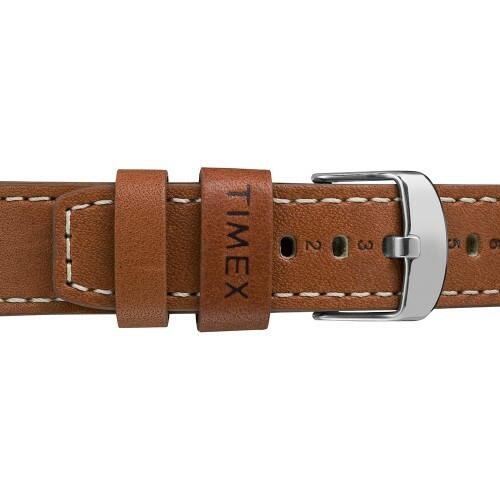 Timex, the 162 year old American company possibly best known for its catchy slogan** and Ironman range of watches, has recently released a limited edition of its field watch-style Waterbury line in collaboration with Minnesota-based work boot maker Red Wing Shoes. Timex as a brand is actually relatively new (c1950), especially when compared to the original Waterbury Clock Company, the later Ingersoll and Waterbury Watch companies or even the United States Time Corporation (which also made Polaroid cameras and Sinclair’s ZX80 and ZX81 computers in Scotland). However, it’s an important one, and one that has produced watches that are not only flight certified by NASA, but have been worn by many astronauts over the past twenty years. The Waterbury 40mm is a standard three-hander with date window and an Indiglo ™ backlight. I’d forgotten just quite how much fun this can be: my first dive watch in 1995, a Casio DW290, had a similar illuminated display, and I recall vividly the reassuring blue light it provided on night dives. Casio’s Illuminator was released three years after Timex’s Indiglo, a form of electroluminescence that effectively works by passing a relatively high voltage through a thin sheet of phosphor. The Waterbury’s leather strap is made by Red Wing, with their logo embossed on the underneath, and numbers akin to boot sizes against each hole. S.B. Foot Tanning Co produces all of Red Wings’ leather, and this strap appears to be the same oil-tanned material, which is highly water, stain and perspiration resistant. Unusually, the numbering on the strap holes appears to go from large to small; I must admit that I’m not sure why. Perhaps a reader might enlighten me? The Waterbury is cheap, comfortable, fun*** and accurate. But it’s a quartz analogue, with a slightly twitchy seconds hand. Quartz; what is it about these six letters that seem to upset so many #watchnerds? We seem to have forgotten that watch production and assembly by Timex in Dundee was highly successful and employed nearly 5,000 people in its day (although the 1993 acrimonious strike and closure left a sour taste for many). Interestingly, I note that there is a Dundee-based watch brand: Kartel Watches has recently launched this model, called the Tarbert, with a Harris Tweed strap. There is, it seems, some good to be found in almost all movements. Probably. The 40mm Waterbury x Red Wing is available from End.Clothing, and costs £79. I purchased one a few months ago, and have even inspired a friend to get one too. It is a lovely looking watch, and great value for money. I have resisted buying one, but I did get a Accurist Clerkenwell 1946 quartz watch some time ago which has a number of similarities: vintage/classic look, simple 3 hander/date, quartz, low price/good value etc. Good to have the “nerd” back. Great Article! !its really informative and innovative keep us posted with new updates. its was really valuable. thanks a lot.